OptoScript is an optional programming language that simplifies certain programming tasks in PAC Control. 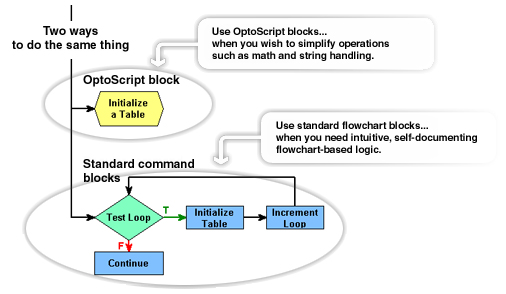 Modeled after computer languages such as C and Pascal, OptoScript code is an alternative to using standard PAC Control commands. OptoScript has the same set of functions as the standard set of PAC Control commands. OptoScript code is used in its own hexagonal block within a chart. The OptoScript block can be used in a chart along with Action and Condition blocks, as shown below. OptoScript code is not used inside of Action or Condition blocks. You’ll want to use OptoScript for some common programming tasks that are more difficult, or more time consuming to do using standard PAC Control commands. For example, extensive math calculations and complex loops can take up a lot of space in a flowchart. OptoScript is an optional programming language that simplifies certain programming tasks in PAC Control.